Mature Width 15 - 20 ft. The Issai Arctic Kiwi is an exciting form of Kiwi Fruit that can be grown in cold regions and will produce up to 100 pounds of fruit from a single plant. You won’t even need a second plant because this unique Kiwi is self-fertile. 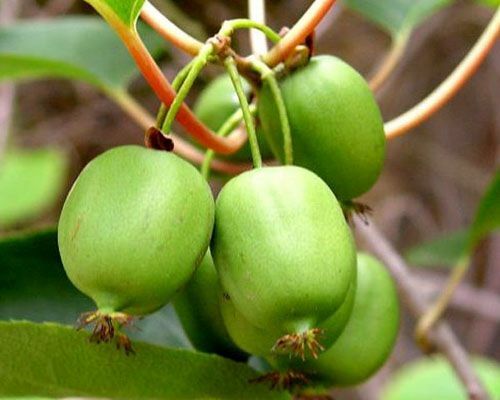 It produces a unique type of kiwi-fruit that is small, like a large grape, and carried in big bunches. The fruit in smooth-skinned, so no peeling is needed to enjoy that refreshing kiwi taste. Your children will love picking them right from the garden, and enjoying healthy treats at any time of day. The Issai Arctic Kiwi will grow right into zone 4 and needs no special type of soil, it will grow in any well-drained soil at all. It is drought-resistant, easy to grow and will even take some shade and still produce bushels of fruit. This plant needs no special care at all to bring you healthy fruit from an attractive vine that will cover a fence, turning it from an eyesore into a thing of fruity beauty. If you don’t have a suitable fence, you can easily build a wire support for your plant. It can even be grown in zone 3, if the vines are taken off the support and wrapped on the ground for the winter. Fruit develops on side-shoots that grow from older stems, so don’t cut your plant down to the ground. Kiwi Fruits have become very, very popular over the last few decades and are widely available. However, if you want to grow your own, to enjoy them fresh and vine-ripened, or to know what chemical treatments they may have had, you need to live in zone 8 or 9, since the plants are easily killed by even moderate frost. As well, the plants are large, growing 30 feet across, and you need a second male plant which just takes up room and produces no fruit. Now all those problems have gone away, with the Issai Arctic Kiwi, which is hardy right down to zone 4, grows just 15 feet across and best of all, is self-fertile (meaning that only one plant is needed,) which will begin to produce bushels of fruit just two years after planting. It is now possible to grow your own Kiwi Fruit almost anywhere in America. The Issai Arctic Kiwi is very easy to grow, in sun or part shade, in any well-drained soil, and the few potential pests and diseases it can suffer from rarely become serious problems. All you need is a support for it to grow on, which could be a fence or some wires stretched between poles. You won’t even need to water after the first year unless you live in a very dry region or there is a bad drought. 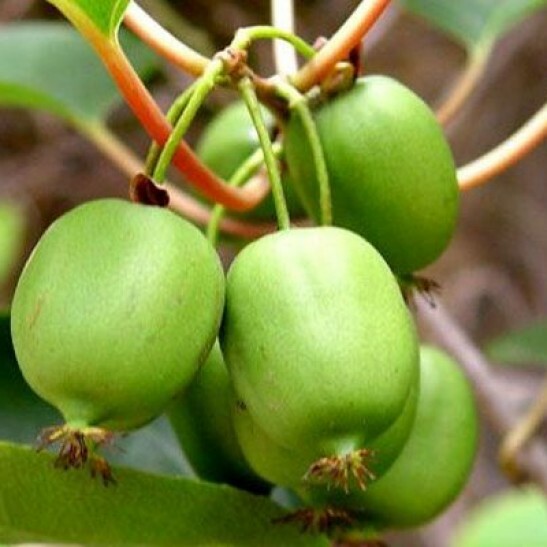 If you like Kiwi Fruit, then you need to grow this plant. The Issai Arctic Kiwi will grow throughout America and may even grow into zone 3 with extra care. It grows in sun or partial shade and can be grown in any soil that is well-drained. To plant, dig a hole twice the size of the pot and plant your vine at the same depth it was in the pot. Put back most of the soil, firm it down and fill the hole with water. Replace the rest of the soil once the water has drained away. Water your new vine well once a week during the first season and after that only during extended dry periods. Fertilizer is only needed if your plant is growing weakly. The Issai Arctic Kiwi is a vine plant, with stems growing 12 to 20 feet long. It climbs with twining stems and tendrils. The plant loses its leaves in winter. The leaves are broad and oval, 3 to 5 inches long and rich green in color. The small greenish-white flowers come in clusters in June and the fruits ripen from September through October, so this is a great plant to extend the season for having your own garden-fresh fruit. Your Issai Arctic Kiwi is a vine so it will need some kind of support. If you have a strong fence that is ideal, but the Arctic Kiwi can also be grown on a simple support made of posts and wire. Drive sturdy posts into the ground so that 5 feet of the post is above ground. For one plant use 3 posts 8 feet apart. Attach a 3 foot cross-beam to each post and stretch three strong wires between the cross-beams. Plant your vine next to the center post. Let a single stem grow up beside the post and when it reaches the wires cut off the tip and train two of the new stems that will be produced along the center wires in both directions. Tie them in and don’t let them twine around the posts or wires. The next year side-branches, called fruiting laterals, will grow from these main stems and drape across the wires. These will carry the big bunches of fruit. Each winter, remove extra laterals so that they are spaced roughly 12 inches apart. Shorten the lateral back so they are well clear of the ground. Each one will fruit for two or three years, so gradually replace them with new shoots as necessary. Cut off any growths from the base or on the trunk below the two main branches. In summer cut back non-flowering shoots so that they don’t shade the fruit and delay ripening. Remove suckers from the base of the plant unless you want to use them to replace a main branch. This special form of the Arctic Kiwi, called Actinida arguta ‘Issai’, was developed in Japan and is a self-fertile female plant. This means that unlike other Kiwi vines, only one plant is needed for a full crop of berries. The Arctic Kiwi is a different species from the common Kiwi found in stores and the fruits are also different. The best part is that they do not have that annoying fuzzy skin, so you can just pop them straight into your mouth – everything can be eaten, including the skin. The Arctic Kiwi is also sweeter, so they are more popular with children, who will really enjoy eating them. Since they also have 8 times the vitamin C of oranges they are the perfect way to keep your children healthy with your own natural produce. The berries are smaller, which makes them fun to eat and your Issai Arctic Kiwi will produce big clusters of grape-sized fruit that more than makes up for their small size. The plants are prolific and will produce up to 100 pounds of fruit a year. The Issai Arctic Kiwi is a special plant that is self-fertile, so only one plant is needed. Our plants are grown from parent pants known to be this exact variety. Beware of cheaper ‘Hardy Kiwis’ that may not be the true Issai variety and will only be a disappointment. Here at The Tree Center, we only sell plants that are true to the original form to give you the best plant for your garden. However, we are constantly renewing our stock so that our customers get fresh, healthy plants, which can mean that supplies of this tree may be limited. To avoid disappointment order now.